Prepping for Allergy Season: Is Your Home Ready? With temperatures still hovering around freezing, it can be hard to believe spring is just around the corner! But even now the trees are gearing up to start sending out their spring pollen. The moment the trees finish, the grass will start germinating, and then it is on to the mould and ragweed invasion of late summer and fall. 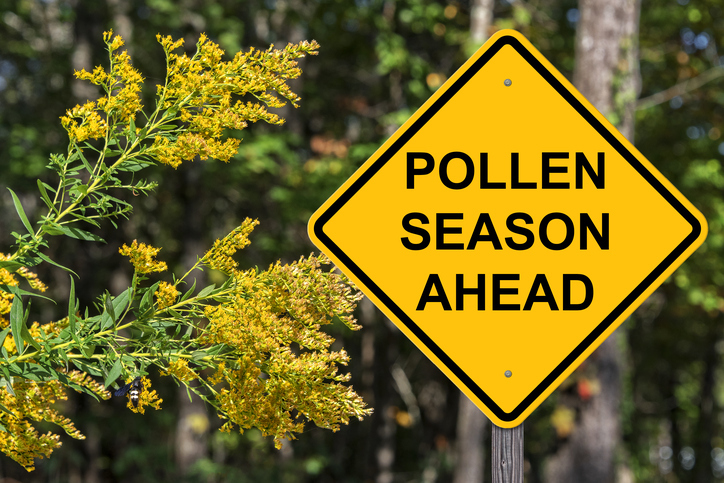 If you are sensitive to tree or grass pollen, mould, or ragweed, now is the time to improve on indoor air purity! This week, learn what your options are to safeguard your hard-working immune system and your hard-hit respiratory system! Regardless of Canada's increasingly changeable weather systems, the annual seasonal allergy calendar stays remarkably consistent. Some health agencies say more people are now being affected by seasonal allergies as a result of climate change. What does this mean for you and your family? If you have not had allergies in the past and notice symptoms such as coughing, sneezing, nasal drainage, itchy or watery eyes, headache, sore throat, and fatigue, this can signal the onset of pollen or mould allergies. No one loves the start of allergy season, especially since once it starts, it typically doesn't abate until late fall. But this can be the year you reduce or eliminate your allergy symptoms—by taking charge of the purity of your indoor air at home and at work. There are four powerful indoor air quality options you can use to filter out unhealthy pollen, mould, mildew, and environmental toxins from your indoor air. When you hear the term "air filtration," you should translate it in your head to mean "fresh air." When your indoor air is being filtered, this means airborne toxins and irritants are being trapped and removed from your air supply. There are many different types of air filters available, but the gold standard is the HEPA filter. HEPA means "high efficiency particulate air" and it dates back to World War II. But today, there is still no other filtration system that can match HEPA for its ability to filter out micro-particles so small they are only the size of 1/100th of a single human hair! You can install a whole-home HEPA filtration system that will work with any type of HVAC system. Alternately, you can use portable HEPA filters at home or at work to purify your air in smaller spaces. How is air purification different than air filtration? The difference is in how the system itself works. A filtration system works to remove, or filter out, airborne matter that can cause allergies and illness. A purification system, on the other hand, neutralizes that same airborne matter so it has no effect on you. The gold standard in air purification is still our own sun, and today's air purifiers harness that same power by generating UV-C band ultraviolet light to zap incoming toxins, pollens and impurities before they ever enter your indoor air supply. Here again, you can choose between installing a whole-home air purification system that works with any type of HVAC or you can use portable UV purifiers at home and at work for smaller spaces. Air circulation is a must-have component to maintain the quality and freshness of your indoor air supply. The best-known method for facilitating air circulation is simply opening a door or a window. You can also turn on a floor fan or overhead fan to circulate the air from room to room and keep it oxygen-rich. But as you are no doubt aware, you can't rely on circulation as your only source of indoor air quality, because circulating the air will also draw pollen and toxins inside along with all that fresh oxygen. So you need to always use air circulation together with other air quality systems so your air is also toxin-free. Ventilation is so important as well for keeping your indoor air pure, oxygenated, fresh, and breathable. Ventilation (along with the seasonal use of humidifiers and dehumidifiers) is also the primary way you can avoid too much or too little humidity in your indoor air. There are different ways you can ventilate your home and work spaces. Exhaust vents, chimneys, fans, air supply registers, and open doors and windows all provide ventilation by moving more or less fresh or humid or dry air in and out of a space. But here again, ventilation can't be used as a stand-alone method of removing pollen, airborne irritants, germs, and toxins from your indoor air supply. It is best used in conjunction with either an air filtration or air purification system plus daily air circulation. The best, most efficient type of air ventilation is provided by a heat recovery ventilator. This unique and efficient system separates incoming fresh, oxygen-rich air from outgoing stale, oxygen-poor air. Not only does a heat recovery ventilator ensure a steady supply of fresh air, but it also balances the humidity in your indoor air to keep mould, mildew, and odours at bay. You can use a whole-home heat recovery ventilator with any type of HVAC system. Save on Whole Home Air Quality Equipment! Our Breathe Clean Air Event is going on right now, and you can save 20 percent on all whole home indoor air quality equipment, including whole-home HEPA filtration, whole-home U.V. air purification, whole-home humidifiers and heat recovery ventilators! Complete this simple online form or give us a call at 905-544-2470 to learn more!